To learn the five easy steps to participate in the GLOBE at Night program, see the GLOBE at Night website. 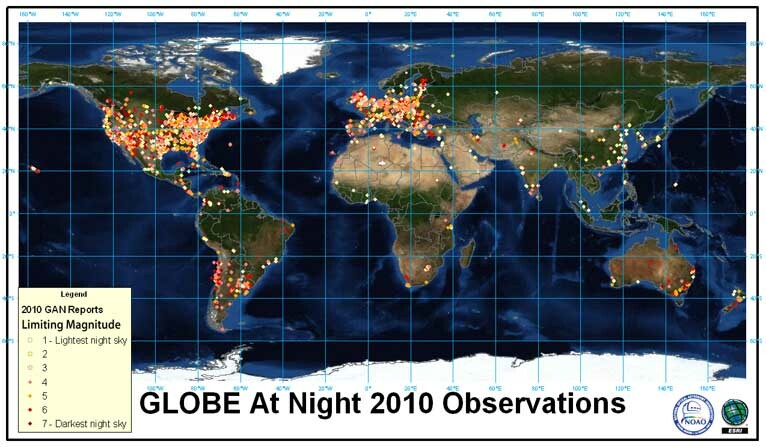 You can listen to last year’s 10-minute audio podcast on light pollution and GLOBE at Night. Or download a 45-minute powerpoint and accompanying audio. GLOBE at Night is also on Facebook and Twitter. The big news is that children and adults can submit their measurements in real time if they have a smart phone or tablet. To do this, you can use the web application. With smart phones and tablets, the location, date and time are put in automatically. And if you do not have a smart phone or tablet, there are user-friendly tools on the GLOBE at Night report page to find latitude and longitude.